DMK chief M Karunanidhi has accused the Tamil Nadu led by political rival, Jayalalithaa of adopting "double-standards" by raining opposition against the Sethusamudram project in Supreme Court. He said that the move by the government is a betrayal of the state. 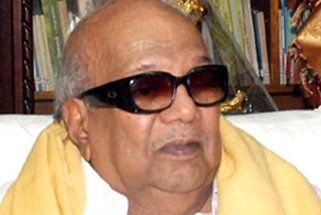 Karunanidhi has been a strong supporter of the multi-million rupees project that has been a controversial project in the state and the country. The project has attracted opposition from some who are against the demolition of the mythical Ram Sethu or Adam's Bridge. "The AIADMK Government had made a written submission in the Supreme Court saying the project was not at all needed. This is a betrayal of the state by the Chief Minister who is hell-bent on burying a project that will augur well for the state's welfare" Karunanidhi said in a statement. He said that the AIADMK had supported the project in its 2001 and 2004 election manifestos but later started opposing the project just to deny the credit of the project to DMK, which started the project. He also said that AIADMK has earlier said in election manifestos that the project would reduce travel time by ships and will also attract foreign investments in the state. The Sethusamudram Shipping project is related to constructing a shorter navigational route around the country's southern tip.